I am so sorry for the death of one of our Angels in blue. They get up everyday and leave for work just like normal people do, not knowing if they will return home to their family like normal people do. They Protect and Serve all the people in the World and never ever think about their lives being taken by one of the people they Protect and Serve. God be with our Angels in Blue, watch over them everyday and every night like normal people but Lord they are not normal people because instead they elect to Watch over, Protect and Serve like you Lord. To all the family's that have lost a man or woman in Blue I Pray and Morn with you for your Angel in Blue. God Bless all our Officers around the World in this Holiday Season so that they can return home to their Wives, Parents, Sisters, Brothers and Children. Bonnie a Person Served and Protected. RIP - never ever will be forgotten. I had the pleasure of working with Officer Toatley. Great man and great officer. Tucker precinct miss you dearly "571." On behalf of my family, I extend our sincerest condolences on the grievous loss you suffered when Kevin was killed. To the Toatley family, fellow officers, and all who call Kevin beloved, my heart goes out to all of you and may you find comfort in your loved ones and your strength in your faith. When my son was killed, the entire law enforcement community in our area embraced us in a circle of love and support, and I know you will receive the same support. It makes the unbearable less torturous, and I pray for your solace. This reflection is sent with the utmost respect for the dedicated service Officer Toatley gave to his community and the citizens of Georgia and for the supreme sacrifice he and his family made on September 19, 2015. RIP Toatley. See you on the other side. John 5:28,29 "the hour is coming in which all those in the memorial tombs will hear his voice and come out"
To the Toatley family, fellow officers, and all who call Kevin beloved, my heart goes out to all of you and may you find comfort in your loved ones and your strength in your faith. When my son was killed, the entire law enforcement community in our area embraced us in a circle of love and support, and I know you will receive the same support. It makes the unbearable less torturous, and I pray for your solace. I hope that your family knows that a nation mourned for you. This reflection is sent with the utmost respect for the dedicated service Officer Toatley gave to his community and the citizens of Georgia , and for the supreme sacrifice he and his family made on September 19, 2015. Our thoughts and prayers are with family, friends and fellow officers. Thank you for your service. May he Rest in Peace! We are here for your family.... There are many of us to lift them up and travel this journey with them. To the family of Police Officer Kevin Toatley, friends, Interim Police Chief J. W. Conroy and the DeKalb County Police Department. May the God of all comfort, comfort you and your family during this most difficult time. May he give you the peace that exceeds all understanding. For remember , "He will swallow up death forever" Isa25:8. May God hold you and your family in his loving arms and may he comfort your family. Thank you for your service. 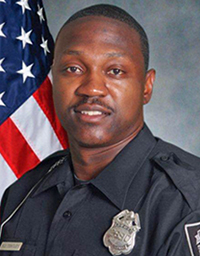 On behalf of Chief James Barber, and the Mobile Police Department family, we express our most sincere sympathy to the family for the loss of your love one, Officer Kevin Jermaine Toatley and the Dekalb County family. Hold on to your faith in the LORD for in time you will heal from the pain. May GOD bless and forever keep you all. Rest with God Officer Toatley. Your tour here is over, thus you are home. Prayers for your family during this time in their lives. Your years of dedicated service will not be forgotten. Thanks for your service, you will never be forgotten. May god be with your family as they go through this tough time. Prayers to your loved ones and to your department. R.I.P brother! !